A new lakeside cabin will be built with scissor trusses in the roof, creating a vaulted ceiling over the kitchen and living area. The GBA reader planning the project provided this photograph to illustrate the cabin's basic construction while asking for advice on the roof stack-up. Kevin is working up the design for a new lakeside cabin in Tennessee, with plans currently calling for a scissor-truss roof and a vaulted ceiling over the kitchen and living area. He wants a trouble-free roof assembly, but local advice on insulation and air sealing has been hard to find. The roof starts with scissor trusses set on 8-foot centers. Between them, running horizontally, Kevin would run 2x6s on 24-inch centers (the 2x6s set on edge), and insulate the bays with fiberglass batt insulation. The bottom of the 2x6s would be covered with tongue-and-groove pine boards. On top, he’d start with OSB sheathing, then add 2 inches of rigid foam insulation, a layer of 1/2-inch plywood, then foil bubble wrap and, finally, metal roofing. He’s ruled out the use of structural insulated panels (SIPs). That’s the topic for this Q&A Spotlight. GBA Encyclopedia: Vented or Unvented Attic? 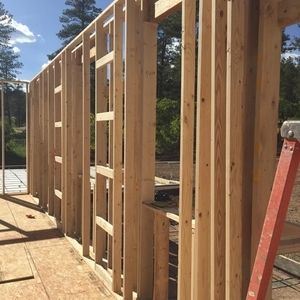 GBA editor Martin Holladay responded to Kevin’s question before Kevin had fully explained his plan to install rigid foam above the roof sheathing. Based on Kevin’s description of fiberglass batts installed between the 2x6s, Holladay noted a glaring weakness in plans: the lack of an uninterrupted air barrier in the ceiling. The ceiling must be airtight. The batts must have a minimum R-value that complies with local building codes. The batts must be installed “impeccably” — that is, without any voids. There must be a continuous ventilation channel in each rafter bay that extends from a vent at the soffit to another vent at the ridge. Ventilation channels should be located between the insulation and the roof sheathing. Taped drywall is one way of creating an effective air barrier. Another option is a layer of spray foam insulation — between 1 and 1/12 inches of closed-cell foam or 2 or 3 inches of open-cell foam. Holladay also takes issue with Kevin’s plans to use foil-faced bubble wrap insulation in the roof assembly. Kevin, however, isn’t so sure that bubble wrap deserves a blanket condemnation. Although he’s aware of the arguments against it, Kevin also offers an example of where it might be effective. But he’s still willing to forego the material in his cabin roof assembly, using asphalt felt instead over the last layer of sheathing and beefing up the purlins that span the scissor trusses from 2x6s to 2x8s. He adds that Kevin will need a “perfect” air barrier at the OSB layer. 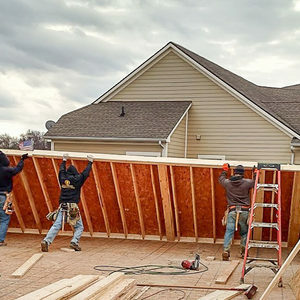 This could come in the form of a peel-and-stick membrane applied on top of the OSB, or with the OSB seams sealed with a high-quality tape, such as Zip System tape. Jon R recommends that Kevin include a vent channel under the metal roofing and above the rigid foam insulation. It would be best, he says, if the roof had some drying potential in both directions. The assembly, for example, might include expanded polystyrene (EPS) insulation and no peel-and-stick layer. He refers Kevin to an article on above-sheathing ventilation available through Texas A&M University. Walter Ahlgrim has been following the discussion and observes the building Kevin is planning looks a lot like a pole barn, a type of building that can be put up “fast and cheap” but has drawbacks for heating and cooling. “Is it just me,” Ahlgrim asks, “or do I see this same question on this and other forums? ‘How can I make my pole barn into a high-performance building for a song.’ OK, that’s not how they write it, but it’s how I read the question. The owners of these building always manage to find some other way describe their building other than ‘pole barn.’ Let’s admit it’s a pole barn! 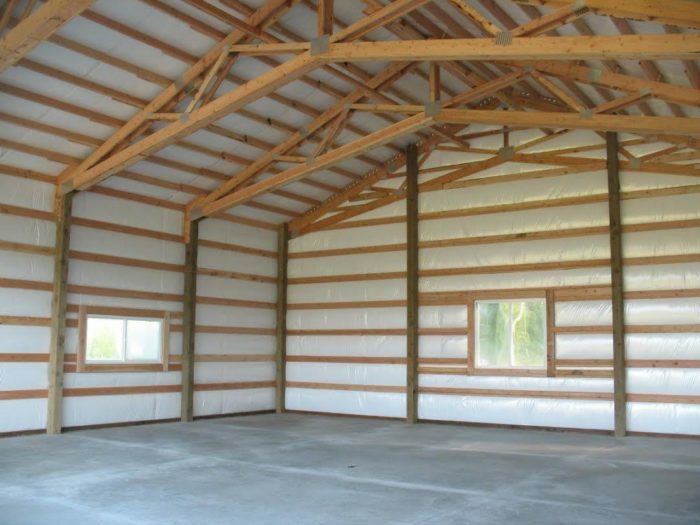 Pole barns are designed and built with one goal in mind, and all other considerations are abandoned for this goal. How to build at the lowest cost per dry square foot possible. 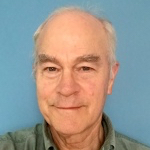 Yet the discussion has led Kevin to a revised plan: trusses with 2×8 purlins, then a layer of OSB sheathing covered with a peel-and-stick membrane, two layers of rigid polyiso insulation, horizontal lath screwed into the OSB through the foam, then metal roofing. In Climate Zone 4, Holladay replies, at least 31% of the total R-value of the roof assembly must come from the rigid foam layer. 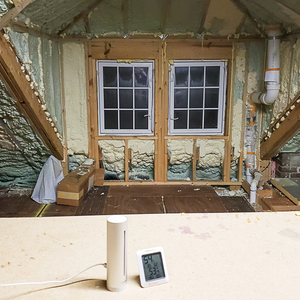 If Kevin were to use two layers of polyiso insulation, with a combined R-value of 13, and batt insulation rated at R-26.8, the foam would meet the minimum requirement. It would, however, be worth checking local codes to make sure an R-40 roof is legal; many jurisdictions in Climate Zone 4 require an R-49 roof. 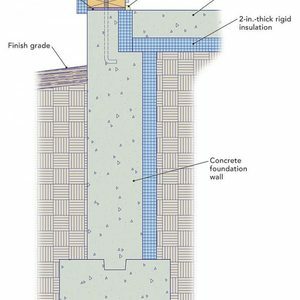 A better plan would be to double the amount of polyiso, creating an R-26 layer. For starters, I think the best resources for code information are these: state maps showing details of the International Energy Conservation Code by county; and building energy codes by state, published by the U.S. Department of Energy. In the example Kevin provided, the scissor trusses are flush with the exterior wall. That means that on the exterior his roof and eave walls are flush and in line with each other, which is a great way to get an exterior air barrier continuous from wall to roof. And with exterior rigid insulation on both the eave wall and roof, the drop-in insulation depth at the scissor truss heel won’t matter nearly as much. I can’t tell you the number of projects I have seen with wood ceiling tongue-and-groove as the interior finish, air-permeable cavity insulation, and substantial air leakage and condensation. Even with a continuous exterior air barrier, convection currents within the interstitial roof cavities move enough moisture to cause problems. It’s logical to think that enough topside continuous insulation, as Martin prescribes, should keep everything above the dew point, but if it were my building I would definitely go with the belt-and-suspenders of both a continuous interior air barrier (taped and sealed gypsum wallboard) as well as an exterior air barrier (taped and sealed sheathing). But what about venting this roof assembly? I just wrote a two-part article for The Journal of Light Construction on this topic. My take (along with Steve Baczek’s) is this: Vent until you can’t. If your roof is really simple, soffit-to-ridge venting is the right choice for most climates, including Tennessee, but if your roof is full of dormers, valleys, hips, and such, getting any real drying potential from air flow is just not going to happen. Quality of construction: Having just come back from a road trip looking at a ton of custom and production home construction, I think that all of our building science logic goes to pieces when the execution completely undermines performance. Most of my building investigations/assessments are more about poor execution than getting the science wrong. Interior conditions: Most buildings have a ton of forgiveness built into them. But if the nature of the building’s purpose (indoor swimming pool, for example) or occupant use (750 gorgeous lush plants) is special, we move into a different region of the psychrometric chart and the margins of forgiveness get razor thin. The article linked to support above sheathing venting shows its effects when used under stone-coated metal shakes. There is no mention of its benefits in general, or under any other materials. This GBA page contains lots of links, and I wasn't sure at first what article you were talking about. After some investigation, I concluded that you were talking about the link provided by GBA reader Jon R in the last paragraph of the section under the heading, "Combining fiberglass and rigid foam." For any confused GBA readers, here is the link: "The Impact of Above-Sheathing Ventilation on the Thermal and Moisture Performance of Steep-Slope Residential Roofs and Attics." I should have been a lot more specific. Thanks.